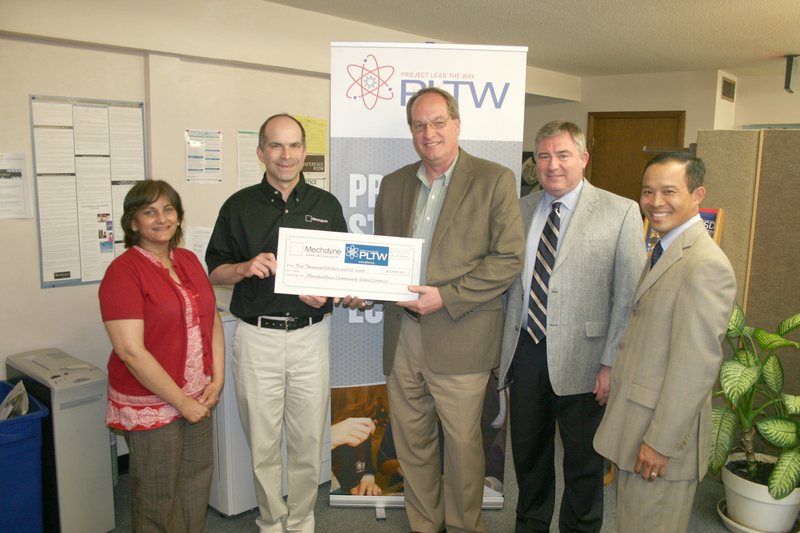 Mechdyne Corporation in Marshalltown donated $5,000 toward Project Lead the Way at Marshalltown High School. Representatives presented a check to the Board of Education at Monday’s meeting. Rogers University will begin its third installment in June, this year serving students from the Rogers Elementary neighborhood entering preschool through sixth grade. “It’s really far more unique than just a summer school,” said Dr. Mick Jurgensen, principal at Rogers Elementary. He said the program takes the idea of the “university” to heart, with teachers known as “professors” and kids having majors and minors. A 21st Century Learning Center Grant secured by Mid-Iowa Community Action funds Rogers University and a network of community agencies and organizations provide support and enrichment for students. Some of this summer’s activities include programs with SATUCI and the Community Y, the summer reading program at Marshalltown Public Library, and a drama component organized by the Orpheum Theater Center. “We have a climate where kids are interested and willing to learn,” Jurgensen said. Preschool students have a two-week program that begins June 10. K-3 students have a six-week program running June 10-July 19. For this first time this year students in grades 4-6 residing in the Rogers neighborhood will participate in a 4-week program June 24-July 19. Students will participate in a variety of activities, including broadcasting and drafting lessons through Marshalltown Community College, service learning at the Iowa Veterans Home and work with Iowa State University. Before she retired, Marshalltown High School art teacher Julie Bousum decided to see how many of her former students she could track down. She wanted to know what they had done with their lives and if their paths included the lessons learned in art classes. Bousum shared the results of her search with the Board Monday, which included pages of names of MHS alum in every facet of the art world. Some are art directors, some graphic designers, some art educators. Others were currently enrolled in prestigious art and design programs across the country. All said their time with the MHS art department shaped their personal and professional lives. While classroom engagement increased in 2012-2013 compared to the previous school year, the increase didn’t meet the projections in the Strategic Action Plan. Engagement is measured through Instructional Practices Inventory, a set of strategies for profiling student engagement in six categories, with 1 being “complete disengagement” and 6 being “student active engaged learning”. This data helps teachers assess and enhance their teaching process to increase engagement and with it student achievement. In 2011-2012 the district saw 86.46 percent of observations scored in the 3-6 range. In 2012-2013 that number increased to 88.3 percent. While the number increased, it fell short of the 92 percent projection in the Strategic Action Plan. Dr. Susan Pecinovsky, associate superintendent for student achievement, told the Board the District will continue organizing IPI data for building-level analysis, as well as building a problem identification and solution process. Dr. Jerry Valentine, the foremost authority on the IPI process, will be conducting training in the District this fall as well. Among other things, tonight’s board meeting included review of financial and academic accountability measures. Just as metrics (e.g. Solvency and Day’s Net Cash ratios) convey the financial condition of our district, the Indicators of the Strategic Action Plan allow us to monitor the academic condition of MCSD – recognizing that progress on these ten Indicators is a big deal because attendance, achievement and the other Indicators are important for the success of our students. While holding us accountable, our Board also acknowledges there is much more to MCSD than the numbers being reported. The Board appreciates the complexity of 21st century education. Each board member understands that every child and adult is unique, and that schools must often address non-academic needs as a precondition for the academic success of many of our students. Just this evening, this “awareness of the bigger picture” was demonstrated through board member comments about a broad array of topics, including Art, Athletics, Band, Healthy US Schools Challenge, World Languages (Chinese), Four Oaks, Project Lead the Way, Rogers University, Promise Neighborhood, Net High, Marshalltown Learning Academy, and Spread the Words – Read by Third! As mentioned in the last issue of The Board Report, continuous improvement is something all Bobcats can expect to see from your Marshalltown Community School District – knowing that our Board values formal -and informal- indicators that we are meeting the diverse needs of our students, families and community. The Board approved sending the MHS Envirothon team to the international Envirothon in Bozeman, Montana, this summer. The MHS team was the state champion and for the seventh time in 14 years will compete at the international competition. Read more about the Envirothon here. Beginning in the second semester of 2013-2014, students in 7-12 science and third and fourth grade will have access to Chromebooks in their classrooms. This is the first step in the District’s Digital Conversion initiative, integrating technology into daily instruction and teaching students the digital literacy skills needed for success in the 21st Century. Besides the Samsung Chromebooks, the District is also investing in online learning resources Learning.com and Edgenuity.com, which provide a wide array of content, virtual labs, lesson planning tools, and individualized learning tools for students at all levels. The District has also invested in a dense wireless network and fiber optic network upgrade that will support this technology, while also increasing overall network speed. The District will begin training staff this summer, with plans for implementation in second semester. In 2014-2015 the District plans to roll out devices in sixth grade and all other 7-12 grade classrooms, with K-2 and fifth grade rollout in 2015-2016. To view the PowerPoint from the Board presentation, click here. School meal prices will increase by 10 cents for 2013-2014. The Board approved increasing K-4 breakfast and lunch to $1.15 and $2.15 respectively and 5-12 breakfast and lunch to $1.20 and $2.30 respectively. Adult breakfast and lunch increase to $1.55 and $3.20 respectively. Milk and reduced-price breakfast and lunch costs will remain the same. The District is purchasing two new school buses from Hoglund Bus Sales in Marshalltown. Transportation Director Don Meyer said the buses were part of the routine replacement schedule. Three buses are being traded in for a net gain of $4,050. The Buses, purchased in 1992, 1994 and 1999, are worn out from use and their bodies have begun to deteriorate from salt erosion related to winter driving. The new buses are 2014 models. One is 35-passenger and the other 65-passenger. The District purchased a used bus earlier this spring as well. To best serve the needs of all students services must be consistently aligned across the District at all grade levels. That was the message Matt Cretsinger, director of special services, brought to the Board as he outlined plans to realign District At-Risk programming. Cretsinger says the District is creating a systemic approach to meet student needs, including a central contact point at each building and clear guidelines on how to access resources. Penny Duer, who currently serves as K-4 At-Risk coordinator, will remain in that role and Eric Goslinga will become Secondary Coordinator of At-Risk Services in addition to serving as administrator of Marshalltown Learning Academy. The realigned services will allow for an expanded continuum of services and allow student access earlier than ninth grade. Competency-based instruction and online resources such as Edgenuity.com will allow for students to complete coursework and gain necessary skills without necessarily repeating courses. At-Risk students are identified by the following criteria: attendance, behavior, failing grades, Iowa Assessments scores, English Language Learner status and Low Socioeconomic status. To view the PowerPoint of the Board presentation, click here. The Board discussed proposed changes to elementary daily schedules for 2013-2014 at Monday’s meeting. Dr. Susan Pecinovsky, associate superintendent for student achievement, said they plan to change the first bell to 8:15am for breakfast at the elementary schools, with the tardy bell at 8:30am. Buildings will have 30 minutes of recess time a day and 90 minutes of Physical Education time in a 6-day cycle. Several parents and teachers spoke to the Board and expressed concern about changes, saying it will reduce the amount of recess time and the quality of physical activity. They also said they didn’t see a correlation between reducing recess time and increasing test scores. The plan to change schedules came after a Department of Education site visit in January 2013 recommended increasing instructional minutes for elementary students by 1,300 minutes a year. Dr. Pecinovsky said elementary principals are still working out the details of their schedules for 2013-2014 and aligning them so students across the district receive the same amount of instruction and physical activity regardless of school building. Abatement Specialties, LLC, of Cedar Rapids will conduct an asbestos abatement at Miller Middle School. The company had the low bid of $68,580, with an alternate bid option added for a total of $70,080. The abatement is part of the work to remodel the 1957 classroom section of the middle school. With 2012-2013 rapidly coming to an end, I want to thank everyone for making this such a memorable year for the students of MCSD. I hope you’ll be able to celebrate the end of the school year by attending upcoming events like the MEA/MCSD Spring Recognition Tea (May 15), Science Bound Spring Honors Banquet (May 17), MHS Commencement (May 26), and picnics at numerous schools. Looking ahead, the summer months seem to go quickly and there is always much to be accomplished, so tonight’s board meeting included several topics for the 2013-2014 school year – handbooks, schedules, construction, bus purchases, food service prices, technology and at-risk service delivery. This enthusiasm to get a “jump start” on next year is just one indicator that continuous (accelerated) improvement is something all Bobcats can expect to see from your Marshalltown Community School District. I look forward to a strong finish to 2012-2013 and getting to work on making 2013-2014 even better. The technology department has recommended purchasing 1500 new Chromebooks for use in all of our 3-4 grade classrooms and in science and math classroom for grades 7-12. This mission also includes rewiring and upgrading our internet and district infrastructure to high speed fiber optics which boost our performance by over 200 times current access speed and capacity. This is the first year of a 3-year plan to put 30 wireless computers in every classroom here at MCSD. The district will begin training this summer, upgrade the infrastructure, and put many of the supporting systems and policies in place. The new notebooks will be in the classrooms by second semester (January 2014). This will change the way we approach learning, instruction, and will prepare our students for our changing world. 405.11 Teachers – Functions, mark reviewed. 405.12 School Nurse – Functions, mark reviewed. 406.1 Salary Schedule, mark reviewed. 406.3 Licensed Employees – Professional Growth, mark reviewed. 406.4 Licensed Employees – Compensation for Extra Duty, mark reviewed. 406.5 Licensed Employees – Group Insurance Benefits, bring back for first reading. 406.6 Annuities – Licensed, mark reviewed. 406.7 Prior Service, define “placement” as on the salary schedule.